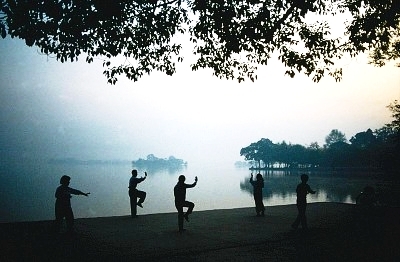 At the heart of Tai Chi solo practice is the traditional Long Form. This extraordinary and challenging study takes us deep into the body and our relationship with balance, relaxation, and coordination. It affords us a tool for the cultivation of our physical, mental, and energetic qualities. With practice, it then guides us into more subtle realms of authentic self-expression and the martial aspects of Tai Chi. In this class we will focus on clear fundamentals and slowly build the form so that each student has a strong foundation upon which to further develop their Tai Chi. We will also include some traditional qigong practices as warm up and cool down. As with any worthwhile endeavor, practice is the key and leads to greater mastery. All experience levels are welcome. Yang style Tai Chi Chuan includes the study of three traditional weapons: the saber, the sword, and the spear. The saber is the simplest of these three. It takes principles and skills developed in bare hand training and extends them into movement and connection with an external object. Saber training also develops new coordinations and furthers skills of balance and spatial awareness. In this class we will explore simple walking drills with saber, 11 angles of attack/defense, the saber solo form, and simple two person saber drills. Some prior experience with Tai Chi is recommended. This class is perfect for beginners or experienced players looking for deeper mastery of the Tai Chi fundamentals. We will look at simple qigong practice, Tai Chi walking drills, and the popular Five Section Short Form. All skill and interest levels are welcome. Qigong can be translated as "the cultivation of our energy and awareness". It is a truly holistic discipline that makes use of balanced body mechanics, conscious breathing, deep relaxation, coordinated movement, and spacious awareness. In this morning class and practice, we will explore the core principles of all good qigong; we'll learn the popular Baduanjin set (eight pieces of brocade), Heaven and Earth qigong, and a simple but deep Zhan Zhuang practice. Group qigong practice is a wonderful experience and a great way to start the day... I hope you will join us! The art of Taijiquan consists of both solo and partner training. Solo practice teaches us about our relationship with ourselves and with gravity while partner training takes that to a new level with the introduction of “external” forces. It allows us to study conflict and harmony in a way that is both effective and a lot of fun. We’ll begin by reviewing the basics for beginners and venturing into the single and double arm drills and beginning walking drills.